Be creative in coming up with promotional gift ideas. This is what catches the attention of your consumers. People love fun and playful but practical gifts. Many companies have taken this into consideration and came up with promotional items such as Bottle Necker, Drinks Stirrer/Frother, T-Shirt in a Can, Plush Bottle Necker, Coaster/Stopper/Glass Gift Set, etc. Take a look at the picture below to see how the Fun Straws look like! How does Fun Straws work? Simply ‘mix n match’ the different shapes of the straws component and connect them to make your very own straw maze. Place the end of the straw into your cup of drink and sip the other end of the straw. Enjoy looking at how the liquid would flow through the straw in a very unique way. 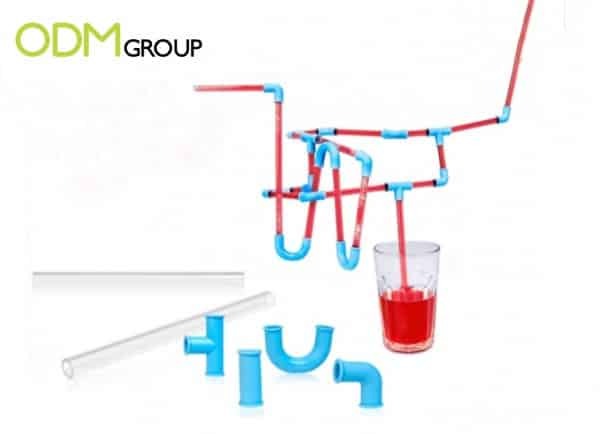 You can even connect the straw components such that more than two people can drink from the same cup at the same time. A very interesting yet usable promotional gift idea one could ever come up with! Giving out creative promotional gifts to consumers would entice them to purchase your company’s products. Majority of people would not like dull and boring giveaways. Fun-looking and interesting gifts would attract more people to have a closer look at them, which would then encourage them to buy your products mainly because of the free gift. This would definitely help your company to generate more sales. Branding is also another crucial point to note in boosting sales for your company. People recognize your company by the brand logo. By branding the Fun Straws with your company logo on it, users would definitely be able to notice the logo and be reminded of your company name. Brand loyalty could even be enhanced in the long run. Why not use this Fun Straws as a free walking advertisement as well? Wait no more and get your very own branded Fun Straws as your company’s promotional gift item!